Are you looking for nature display ideas? You’ve come to the right place! I’m Susan Evans, your homeschool organization guru, and today I’m going to show you how to organize a beautiful nature display. First you will need some sort of wooden shelf with compartments. I got mine at a yard sale for $3. It had no backing on it, so I went to the store and bought a posterboard that was black and very stiff. (You can also use black velvet board.) The black color really pops to help make your display look gorgeous, by the way. After I had the backing on the display, I wanted something strong to hold it up because you’re going to have nature collections that include objects that are heavy. So you want a heavy-duty wire, and then use your industrial stapler to staple the wire into both sides on the edges. Here are some items you can have in a nature display: fossils, a bird’s nest, rocks and minerals, feathers, animal sculls, snake skins, pine cones, seeds, seashells, moss, old cocoons, blue egg shell from robins, etc. The items are just leaned up against the back. If you don’t want the items to slip down, you can put a little tiny dab of hot glue on the back that would hold it in place. 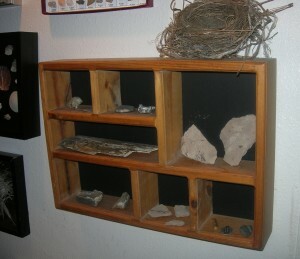 Now you have a nifty, fabulous nature display area for your homeschool. If you would like more ideas on Organizing for a Fun Homeschool, I have a two-hour video workshop where I show you every room in my house just like this. Go check it out! This entry was posted on Thursday, January 5th, 2012 at 9:45 am	and is filed under Organization. You can follow any responses to this entry through the RSS 2.0 feed. You can skip to the end and leave a response. Pinging is currently not allowed. Hi Susan, In stead of putting a dot of hot glue onto the back of you shelf and getting the stone attached to the back of the shelf. Take that hot glue gun and draw a line on the shelf. Items will then only slid to the glue line and not slip off of the shelf. If you are using a clear glue it will be practically invisible. Good idea! Hot glue is clear, so you won’t really notice it.